Last month legendary basketball coach Dean Smith passed away. He coached the Tar Heels of UNC-Chapel Hill from 1961 to 1997 and when he retired he was the coach with the most wins of any in collegiate basketball history. He had two national titles to show for it. Along the way he coached about 184 players. And every one of them is getting $200 to enjoy a nice dinner out. 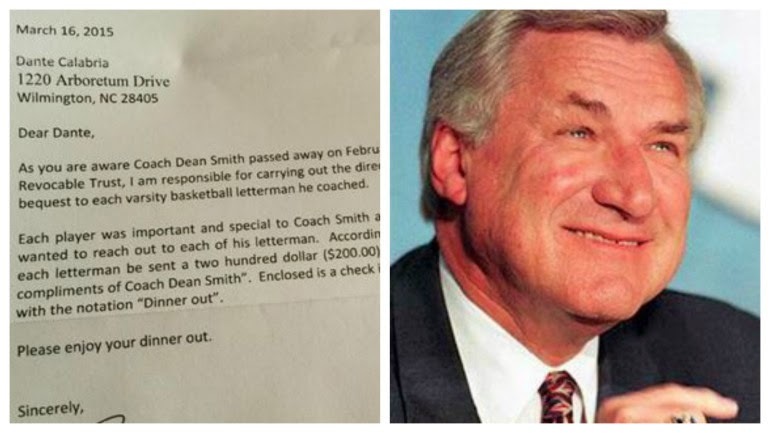 Each player who lettered under late North Carolina head men’s basketball coach Dean Smith is receiving a surprise gift from the coach himself: $200. My respect for this man continues to grow. Again, very classy.